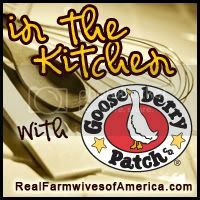 I love Gooseberry Patch books - I think I own about 40 - between cookbooks and Country Friends books. My 2 all time favorite go-to recipes came from their books and I have made them sooo much I have them memorized! But I'll be honest I am nervous too! For my loyal readers reader you will notice that I don't post recipes - I love to cook and bake - Chris says I am pretty good, my kids complain (but I try to ignore them they think junk food is an actual food group) but I take awful pictures of the food - it tastes really good, it looks good on the table but the pictures turn out awful so I just don't post them. Not to mention that my kitchen is always a mess and so the pictures of the process - well aren't pretty either! I know I did the interview for my voting post on The Real Farmwives of America that told a little about where I learned to cook but I thought I might share more so that you all know how important food and family and the combination are to me and that I cook everyday, that I have never made anyone sick, that I actually enjoy the cooking part (you will see in my pics later not so much the cleaning part) but I just don't take good pictures of food! A few years ago (well actually probably 7 I just didn't get it finished for 5) I put together a family cookbook for my Mom, MIL, sisters (yes Lisa I consider you a sister not just a SIL) and my Grandma. It was fun, it was more than just recipes it is full of memories! I started off with pics of all of the girls with our "first" kitchens, followed by every one's top 10 food memories and then recipes (handwritten by the person) from 3 generations of women on both my side and my hubs side, plus my Dad's famous homemade ice cream recipe and my FIL favorite snack recipes! I posted it on my blog so you can check it out! I call it that mostly for lack of a better term I don't really expect it to be used as a cookbook but rather as the title implies some"entertainment" and tidbits about our family regarding food! I do love to cook and I still hate to set the table, put ice in the glasses and do the dishes! I was hoping that one day the kids would do this for me - but keeping with tradition, if I ask Casey to do it she goes straight to Emi Lou or Cole and tells them I have asked them to set the table! I don't specifically remember Mom teaching us how to cook but figure that is where I learned what I know! Mom is the only person I know that can take two small carrots, a potato and hunk of frozen meat and have a full meal for five grown (hungry) men in less than 30 minutes, and never fear there will be dessert - she could turn "one schribbled apple" into apple pie with on hand tied behind her back! She always says we are welcome for supper anytime -"but we arent' having much"! I think Bunk says it best "Every meal at Grandmas is a huge Thanksgiving feast!" I appreciate now how much work family dinners can be and how important they truly are! I am very lucky to have married into a family that knows that importance as well! I love getting together for meals - big meals, cookouts, pizza - the food is always different but the goal is the same - being together! Each of you are such awesome cooks we never leave any of your homes disappointed! I wanted to put this book together for several reasons - you each have special recipes that are uniquely yours - we can follow the recipe but they don't taste quite the same as when you make it! I wanted them in your handwriting because I think it truly makes it yours and hopefully that our kids will look at it someday with the happy memories of family meals that I have! "It isn't so much what's on the table that matters as what's on the chairs"
I actually found this quote about 10 years ago in a Gooseberry Patch cookbook and I love it - this is exactly how I feel when I sit at my kitchen table to eat with friends and family! So I can't wait to get started cooking out of Church Suppers, actually we have all sat down and flagged our favorites, but if my pics don't turn out very good please don't blame the cook blame the photographer! This is such a great idea! What a wonderful piece of family history! My food photos always turn out bad too. AND I have to clear off one space in the kitchen that is my "photo spot" and try to crop out the rest of the mess! Good luck. LOVE this post, Jent...and so touched that you found a quote for your home in one of our books! :) We're sure that whatever you choose to share will be great. Thanks again! Love this post Jent! And... I am sooo stealing that quote. Love the quote, love the book, love that fact that we ALL have to clear away a spot when we take pictures of our food, and LOVE the calf bottle in the kitchen pic! It's all a part of being a farmer! You are so right! I am inspired now to write a family cookbook for my family. Great quote you found and may still that idea too! Good eye, Lana - I had to scroll back up and look again! I wrote about unappealing food photos today, too, I totally know how you feel! I also love the book idea, my mom recently gave me a cookbook of her grandmother's recipes - all hand written or typed by my great-grandmother, with photos inserted randomly throughout. I am now working to collect my husband's grandmother's recipes to try a similar collection. Can't wait to see your recipes! This is why food photos are great. You can zoom in right on the food and exclude all the background mess. I so love your cookbook idea and the quote in your house. Can't wait to follow along with your recipes.